Norwegian ice skater, and later movie star, Sonia Henie was born in 1912. She won the Olympic title in 1928, 1932 and 1936 and was world champion ten years in succession between 1927 and 1936. Henie won more Olympic and World titles than any other ladies’ figure skater. At the height of her acting career, she was one of the highest paid stars in Hollywood and starred in a series of box-office hits, including Thin Ice (1937), My Lucky Star (1938), Second Fiddle (1939) and Sun Valley Serenade (1941). She was diagnosed with leukaemia in the mid-1960s. She died of the disease at age 57 in 1969 during a flight from Paris to Oslo. At Aintree in 1967, Foinavon, ridden by Jack Buckingham, joined an exclusive club, that of 100-1 winners of the Grand National. He avoided the pile-up at the 23rd fence, which caused most of the field to fall or refuse, to come home a comfortable victor. A total of 42 years passed after Foinavon’s victory, before Mon Mome became the next 100-1 winner of the Grand National. Venitia Williams became only the second woman to train a Grand National winner, while Mon Mome’s jockey Liam Treadwell rode the horse to victory on his Grand National debut. On this day in 1968 Baseball’s Opening Day was postponed due to the assassination of Martin Luther King. The artist Pablo Picasso died of a heart attack at his chateau near Cannes on the French Riviera today in 1973. His wife, Jacqueline, and son, Paolo, were with him when he died. The artist who had lived in seclusion for some years is reported to have suffered from influenza during the winter but continued to paint. He was making plans for more than 200 pieces of his work to be shown at an art museum in Avignon next month. The previous year, to mark his 90th birthday, the Louvre Museum in Paris staged a Picasso retrospective – the first time the work of a living artist had been exhibited. The sculptor Henry Moore said that Picasso was probably one of the most “naturally gifted” artists since Raphael. France’s culture minister, Maurice Druou, said Picasso “filled his century with his colours”. Born in 1881 in Spain, the son of an art teacher, Picasso exhibited his first paintings in Barcelona at the age of 12. During his lifetime he is said to have produced approximately 20,000 paintings, sculptures and drawings. Arguably his best known painting was Guernica, inspired by his outrage at the destruction of a small Basque town during the Spanish civil war and exhibited at the Paris World Fair in 1937. Picasso, a lifelong Communist, supported the republican government defeated by General Franco’s forces and never returned to his homeland after Franco’s victory. His fortune has been estimated at $50m – his legal heirs are his wife, Jacqueline, and Paolo, his son from his first marriage to a Russian ballerina. Picasso also had at least three illegitimate children who are expected to make a claim on his estate. Nick Faldo won his second successive US Masters title in 1990. For the second year running the competition went to a play-off, Faldo again winning at the second extra hole, this time at the expense of the luckless Raymond Floyd. Faldo become the then third consecutive British winner and only the second man, after Jack Nicklaus, to win the title back-to-back. Today in 1991 American jockey Bill Shoemaker, who for 29 years held the world record for total professional jockey victories, was paralysed in a car accident. He was involved in a solo drunk-driving car accident on April 8, 1991, in San Dimas, California, when he rolled over the Bronco II he was driving. The accident left him paralyzed from the neck down, and he thereafter used a wheelchair. Shoemaker sued Ford, and Ford settled with Shoemaker for $1,000,000. Piotr Morawski, Polish mountaineer, died, aged 32, after falling into a crevasse at an elevation of 5500m while acclimatising on an international Dhaulagiri/Manaslu expedition in Nepal in 2009. 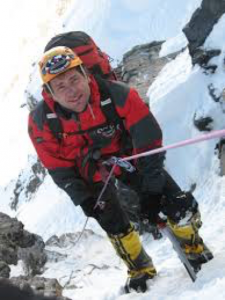 Morawski was best known for making the first successful winter ascent together with Simone Moro of Shishapangma on January 14, 2005. Today in 2012 Bubba Watson defeated Louis Oosthuizen at the 2012 Masters. In 2015 the then world’s oldest living person, Gertrude Weaver of the USA, died at 116 years of age. She lived only five days longer than the previous record holder, Misao Okawa of Japan who died aged 117. Charles “Carl” Winckler was born today in 1867. He was a Danish athlete and tug of war competitor who participated at the 1900 Olympics. He finished tenth in the shot and eighth in the discus, he was also part of the Dano-Swedish tug of war team which won the gold medal against opponents France. Irish racehorse trainer Vincent O’Brien was born in 1917. Successful both on the flat and over the jumps, he saddled winners of all the major Classics in England and Ireland, as well as other prestigious races such as the Prix de l’Arc de Triomphe and King George VI and Elizabeth II Diamond Stakes. The best horse he ever trained was the 1971 Triple Corwn winner Nijinsky. Russian high-jumper Mariya Pisareva was born on this day in 1934. She trained at Zenit in Moscow and competed in the 1956 Olympics held in Melbourne, Australia in the High Jump where she won the silver jointly with Thelma Hopkins. After her athletic career she married discus thrower Oto Grigalka. Valerie Singleton, English television and radio presenter best known as a presenter of the popular children’s series Blue Peter, was born toady in 1937. She also went on to present the BBC Radio 4 PM programme for ten years as well as a series of radio and television programmes on financial and business issues. She joined the BBC in 1961 as a continuity announcer and in 1962 joined Blue Peter, where she stayed until 1972. She then continued until 1975 in a part-time role as a ‘roving reporter’. 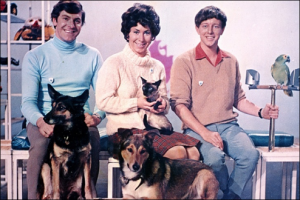 Along with John Noakes, she continues to be more closely associated with Blue Peter than any other former presenter. During her time on Blue Peter, Singleton accompanied Princess Anne on her first solo trip overseas in a Kenyan Royal Safari in 1971. In 1998, the two women met to reminisce about the Royal safari for one of Blue Peter’s fortieth anniversary programmes. Although she stopped presenting Blue Peter full-time in 1972 she continued making regular appearances, and was credited as a presenter until the end of 1975. The documentary on the Royal Safari led to a spin-off series, Blue Peter Special Assignment, in which Singleton was solo presenter. It was shown at weekends and ran from 1973–81. Each edition focussed initially on European capital cities, but later covered islands and well-known historic figures. Blue Peter fans look away now….. Singleton admitted in 2008 that she had conducted affairs with, inter alia, her co-presenter Peter Purves and the film actor Albert Finney. For a period she was also engaged to be married to the Radio 1 DJ Peter Murray, and noted “We might, for all I know, have married and been ecstatically happy. But I suspect it would not have worked. I read that he goes on holiday at the same time to the same place each year. And that wouldn’t have been me.” Singleton had been presenting Blue Peter for just a year when she became involved in a relationship with writer Richard Wade and fell pregnant. She said: “I knew I couldn’t keep the baby. Richard had been seeing less and less of me and I’ve never wanted children.” After an abortion, the affair with Wade petered out. Severiano Ballesteros was born in 1957. One of the best golfers to come from mainland Europe, he made his mark as a 19-year-old when he finished second to Johnny Miller in the 1976 British Open at Royal Birkdale. A World No. 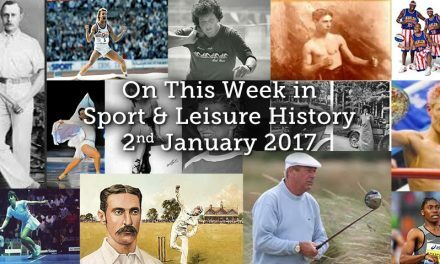 1 who was one of the sport’s leading figures from the mid-1970s to the mid-1990s. A member of a gifted golfing family, he won more than 90 international tournaments in an illustrious career, including five major championships between 1979 and 1988: The Open Championship three times, and the Masters Tournament twice. He played a leading role in the re-emergence of European golf, helping the European Ryder Cup team to five wins both as a player and captain. He won the World Match Play Championship a record-tying five times. He is generally regarded as the greatest Continental European golfer of all time. Ballesteros won a record 50 European Tour titles. He won at least one European Tour title for 17 consecutive years between 1976 and 1992. His final victory was at the 1995 Peugeot Spanish Open. Largely because of back-related injuries, Ballesteros struggled with form during the late 1990s. In spite of this, he continued to be involved in the game of golf, creating the Seve Trophy and running a golf course design business. Ballesteros eventually retired from competitive golf in 2007 because of continued poor form. In 2008 he was diagnosed with a malignant brain tumour. 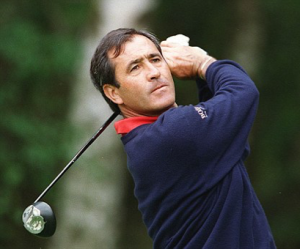 Ballesteros was awarded the Lifetime Achievement Award for the second time at the BBC Sports Personality Awards 2009. He was presented with the award at his home in Spain by his friend, compatriot and former Ryder Cup team-mate José María Olazábal. After reports that he would make a return to the spotlight at the 2010 Open Championship, on the advice of doctors he did not travel to St Andrews. 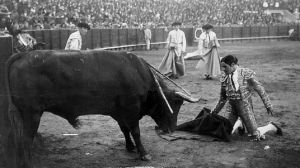 Ballesteros died of brain cancer on 7 May 2011, aged 54. 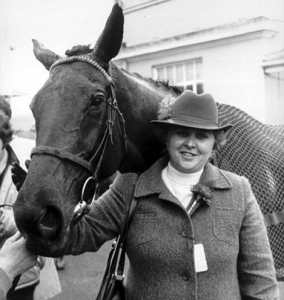 In 1983 Jenny Pitman became the first woman trainer to saddle a Grand National winner when Corbiere, ridden by Ben de Hann, won at 13-1. On this day in 1988 Eddie Hill became the world’s first driver to cover quarter of a mile in under 5 seconds. Hill set the first four second elapsed time (4.990 seconds) at the International Hot Rod Association (IHRA) Texas National, he made the run on only seven cylinders; the post-run computer readout showed his number 7 cylinder failed at launch. Also on this day in 1988 Southampton’s Alan Shearer became the youngest player at the time, 17 years and 240 days, to score a first-division hat-trick, against Arsenal. Forrest Grady “Spec” Towns, American track and field athlete, died on this day in 1991 aged 77. He grew up in Augusta, Georgia, where he played football in high school at Richmond Academy. In 1933, he earned a football scholarship to the University of Georgia (UGA) after a sports journalist had seen him high jumping in his back yard. Rather than high jumping, Towns specialized in the high hurdles, winning NCAA and AAU titles in the 120yd hurdles in 1935. It was the beginning of a 60 race winning streak, lasting until 1937. In 1936, Towns was named in the American Olympic team, becoming the first Georgian to achieve this. During the Olympics in Berlin, Towns became the world record holder with 14.1s, and he won Olympic gold in 14.2s. Also, he became the first Georgian to earn Olympic Gold. Shortly after the Games, he became the first hurdler to go under 14 seconds. At a race in Oslo, he dramatically improved the world record to 13.7 – a time that would stand until 1950. After college, Towns became Head Track and Field coach at UGA, a position he held until 1975. He was honoured at the University with the naming of the Spec Towns Track, and an annual meet called the Spec Towns invitational. Malcolm Thomas, former Welsh and British Lions international rugby union player, died today in 2012. A centre, he played club rugby for Newport. He won 27 caps for Wales and was selected to play in the British Lions on two tours of Australia and New Zealand. He also played cricket for Cornwall in the 1951 Minor Counties Championship, making four appearances. Footballer, with a reputation for aggressive play regarded as one of the “hard men” of English football – Frank Barson was born in 1891. He played for several English football clubs including Barnsley, Manchester United, Aston Villa and Watford. 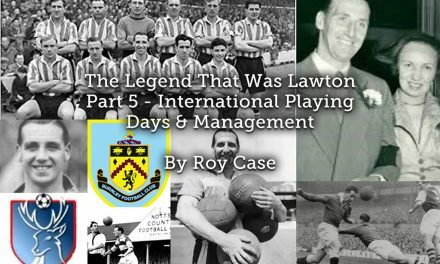 Born in Sheffield he began his career working as a blacksmith and playing for amateur clubs Albion FC and Cammell Laird’s, before joining Barnsley Football Club in 1911. He transferred to Aston Villa in 1919, with whom he won the FA Cup in 1920, and to Manchester United in 1922, with a transfer fee of £5000. The Times once noting that “On frequent occasions Barson was escorted out of grounds by policemen to protect him from groups of angry opposition fans.” Opposing crowds loathed him, forcing him to publicly defend himself on the grounds that he had been “brought up to play hard and saw nothing wrong with an honest to goodness shoulder charge.” One violent challenge in a match against Fulham resulted in a seven-month ban. In May 1932 he became the player-manager of Rhyl, where he remained until his contract was terminated in March 1935. Within three months he re-surfaced as the manager of Stourbridge but an offer to return to Aston Villa as youth coach in July 1935 meant he gave up the job as soon as a replacement was found. Three months after his appointment as youth coach, he became the senior coach and head trainer at Villa Park until the outbreak of the Second World War. He became the trainer at Swansea Town from June 1947 until February 1954 and he finished his career in May 1956 after previously spending almost two seasons as the trainer at Lye Town. Barston died on 13 September 1968 at Winson Green, Birmingham, at the age of 77. On this day in 1896 Spiridon Louis, a 24 year-old Greek shepherd became the hero of the Games when became the 1st Olympic marathon title holder. This was the event the Greek hosts wanted to win more than any other due to its great historical significance. Today in 1924, the USGA finally legalized tubular steel golf-club shafts, although the R&A continued to ban them until the Prince of Wales used a set at St Andrews in 1929 which helped force a rule change. The first steel shafts were allowed in the US Open, they were allowed in putters only, the winner, Cyril Walker, used one. The RMS Titanic set sail on this day in 1912, from Southampton, on her maiden and only voyage. 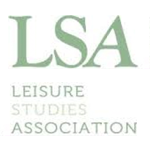 In 1916 the Professional Golfers’ Association of America (PGA) was created in New York City. 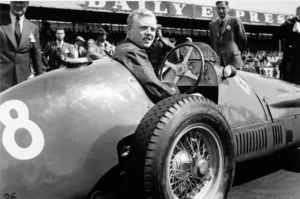 The first British world motor-racing champion Mike Hawthorn was born in 1929, less than 6 months after winning the title, in 1958; he was killed in a car crash in Surrey. Stan Mellor, the former champion National Hunt jockey, was born in 1937. Champion Jockey three times between 1960 and 1962, he was the first man to ride 1000 winners under National Hunt rules. Surprisingly, he never won the Grand National, Cheltenham Cup or Champion Hurdle. Gloria Hunniford, British radio and television host, was born on this day in 1940. British sprinter Linford Christie was born in 1960. Linford achieved his ultimate goal of winning the Olympic 100m title at Barcelona in 1992. Olivia Borlée, Belgian sprinter, was born on this day in 1986. She won a bronze medal in 4x100m relay at the 2007 World Championships, together with teammates Hanna Mariën, Élodie Ouédraogo and Kim Gevaert. With 42.75 seconds the team set a new Belgian record. Borlée represented Belgium at the 2008 Olympics in Beijing. She competed as part of the 4x100m relay together with Gevaert, Mariën and Ouédraogo. In their first round heat they were placed first in front of Great Britain, Brazil and Nigeria. Their time of 42.92 seconds was the third time overall out of the sixteen participating nations, which qualified them for the final in which they sprinted to a time of 42.54 seconds and silver behind Russia but in front of Nigeria, missing out on the gold medal with 0.23 seconds. However, one of the Russian runners was later found to have used performance-enhancing drugs resulting in the Russians being disqualified thereby promoting Belgium to the gold medal, which was awarded eight years later on September 10, 2016. Borlée represented Belgium at the 2016 Olympics in Rio de Janeiro, competing in the 200m where she finished 7th in her heat with a time of 23.53 seconds, but not qualifying for the semi-finals. She was the flag bearer for Belgium during the Parade of Nations. Olivia Borlée’s brothers Jonathan Kevin and Dylan are also athletes. Coached by their father, Jacques Borlée, they ran to the 4th place in the 2016 Olympic 4x400m relay final. In 1989 Nick Faldo won his second US Masters title, beating Scott Hoch in a play-off at the second extra hole. Paul McCartney announced that he was to leave The Beatles for personal and professional reasons on this day in 1970. The People’s Republic of China hosted the USA table tennis team for a week-long visit starting today in 1971. This so called “ping-pong diplomacy” was an attempt to thaw relations with the United States. American born Spanish swimmer Martin Zubero swan a then world record time for 200m backstroke of 1:52.51 in 1991. The East German long-jumper Angela Voigt, (née Schmalfeld) died on this day in 2013 aged 61 following a short, severe illness. Voigt was born in Weferlingen, in what was then East Germany, on 18 May 1951. She was originally a pentathlete, and finished third and second at the East German championships in 1972 and 1973. Because of injuries she eventually concentrated on just the long-jump. She finished fourth at the 1974 European Championships. Voigt set a long-jump world record of 6.92m at Dresden in May 1976 but it was broken ten days later by Siegrun Siegl. At the 1976 Montreal Olympics Siegl finished fourth while Voigt won the gold with a leap of 6.72m. Kathy McMillan, who eventually finished second, had a longer jump which was deemed a foul. At the 1978 European Championships Voigt won a silver medal, having given birth to a son the previous year. 6.92m remained her career best jump. In 2005 Australia defeated Indian by 98 runs in the Cricket Women’s World Cup. Following a concert in Rio de Janeiro in 2011, the band U2’s tour, ‘360 Degrees’, becomes the highest grossing musical tour of all time. Online pre-orders began for the Apple Watch today in 2015, initially planned for sale on April 24th; however, the volume of orders pushed delivery dates into June/July. The 80th playing of the US Masters was won by England’s Danny Willett in 2016, shooting a five-under 283. Today in 1913 the cricket pavilion of the Nevill Cricket Ground in Tunbridge Wells was burnt down by militant suffragettes due to Kent having a policy of no-admittance to women. 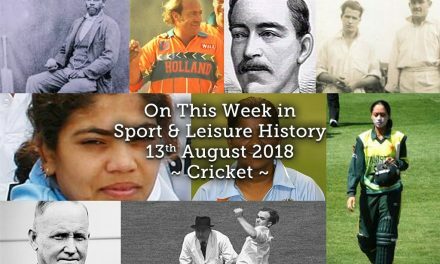 The fire was started in the dressing rooms with the perpetrator setting fire to the cricket nets, the fire was discovered by a passing lamplighter. The fire brigade extinguished the fire within an hour but too late to save the pavilion. In front of the remains of the pavilion, firemen found suffragette literature, an electric lantern and a picture of Emmeline Pankhurst. The fire also destroyed photographs of the first Canterbury Cricket Week and the Bluemantle Cricket Club’s archives. The attack may have been provoked by a comment from an unknown Kent official who is reported to have said “It is not true that women are banned from the pavilion. Who do you think makes the teas?” There was an angry reaction to the attack locally and nationally. The National League for Opposing Woman Suffrage held a meeting in the town with Sir Arthur Conan Doyle attending, where he called the suffragettes “female hooligans” and compared the attack to “blowing up a blind man and his dog” A new pavilion was built using the original designs after a series of fund raising concerts at the Opera House at a cost of £1,200. Construction was finished in 9 weeks, being completed hours before Kent were due to play at the Tunbridge Wells Cricket Week in July 1913. Nevill Ground was the only cricket ground to be attacked by suffragettes. Yuriy Lituyev, Russian 400m hurdler was born today in 1925. He trained in Leningrad and later in Moscow at the Armed Forces sports society. Lituyev took part in WWII, where he was a battery commander. He competed for the USSR in the 1952 Helsinki Olympics where he won the 400m silver. 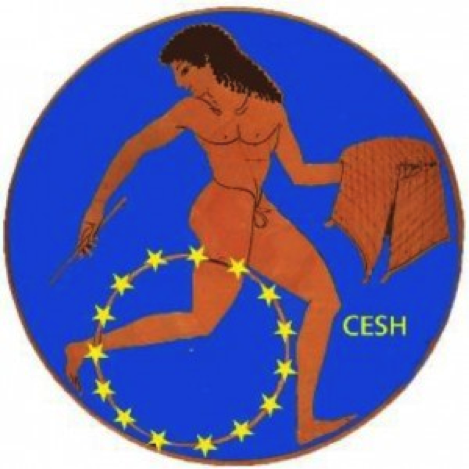 He also represented his country at the European Championships, winning 1 gold and 2 silvers. He held both European and world records at 400m hurdles during the 1950s. Welsh former rugby union and rugby league player and dual-code international, Lewis Jones, was born today in 1931. He won nine caps for Wales at fullback, centre and wing before turning professional and playing rugby league for Leeds and Great Britain. 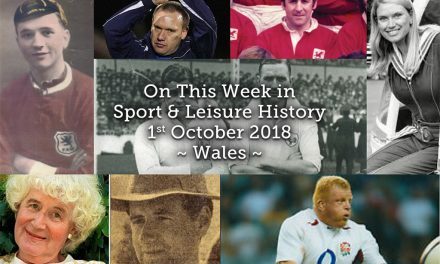 Rugby league historian Robert Gate has described Lewis Jones as “arguably the most devastating attacking back Wales has ever produced.” His acceleration over the first few yards allowed him to penetrate almost any defence in the mid-1950s. Jones’ Testimonial match at Leeds took place in 1963. He was the first Leeds player to score over 1,000 goals for the club, a feat not matched until 2009 Kevin Sinfield. Jones became one of fewer than ten Welshmen to have scored more than 2,000 points in their rugby league career. Jones won 15 caps for Great Britain at rugby league, scoring in every game he played. He spent six years as a player-coach in Australia. A schoolteacher by profession, he later taught mathematics in Leeds. Arriva Yorkshire honoured thirteen rugby league footballers on Thursday 20 August 2009, at a ceremony at Wheldon Road, the home of Castleford. A fleet of new buses were named after the ‘Arriva Yorkshire Rugby League Dream Team’, which included Jones. 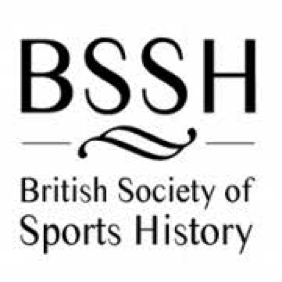 Members of the public nominated the best ever rugby league footballers to have played in West Yorkshire, supported by local rugby league journalists; James Deighton from BBC Leeds, and Tim Butcher, editor of Rugby League World. In 2013 Jones was inducted into the Rugby League Hall of Fame. On this day in 1955 Gary Sobers started his run of 85 uninterrupted Test Cricket appearances for the West Indies. 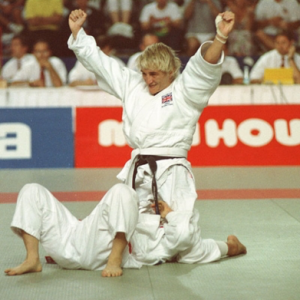 One of Britain’s leading female judo exponents Karen Briggs, was born in 1963. She has won numerous World and European Championship medals, and represented Great Britain in the 1992 Olympics, the first year Women’s Judo was included as an Olympic sport (first as a demonstration event in 1988) and was placed fifth after suffering a dislocated shoulder. She also won four World championships in the 1980s and grabbed gold at judo’s appearance in the Commonwealth Games in 1990. Since retiring from competition she now runs judo classes at 26 schools in East Yorkshire and coaches at a regional centre of excellence alongside her husband Peter Inman, also a former England international. 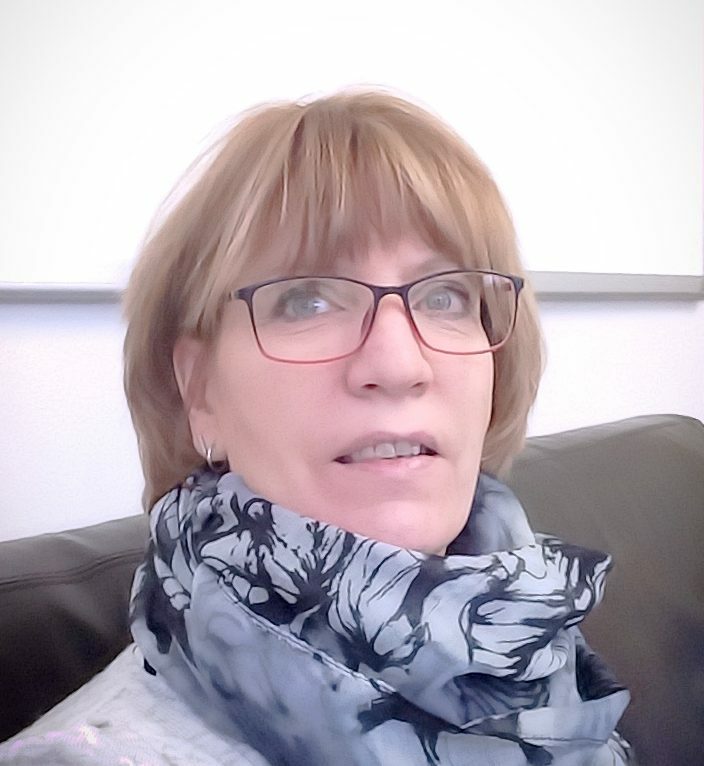 In August 2015 Dr Karen Briggs was inducted into the IJF hall of fame. The 30th installment of the US Masters in 1966 was won by Jack Nicklaus, shooting a 288 to take the title. David “Dai” Greene, Welsh and British 400m hurdler was born today in 1986. In a sixteen-month period between 2010 and 2011, Greene won the World, European and Commonwealth titles in the event, in addition to winning the event as part of the European Team Championships and the IAAF Continental Cup. At the Diamond League event in Paris on 6 July 2012, Greene ran a personal best of 47.84 secs in finishing second to Javier Culson to move even closer to the British record in the 400m hurdles. Greene was selected to captain the Great Britain athletics team for the 2012 London Olympics, as one of the favourites for a medal. In the first round Greene won his heat in 48.98s, the fastest time of the round. In the semi-finals Greene ran sluggishly, finishing fourth and only qualifying for the final as a fastest loser. In the final Greene finished fourth behind 2004 Olympic champion Félix Sánchez, surprise American Michael Tinsley and Javier Culson, running slower than he had in the semi-final. Post-race Greene admitted huge disappointment, and blamed disruption to his training caused by a knee injury in the winter. Greene also ran in the final of the 4×400m relay, as the British team finished fourth, just 0.13 seconds off a medal. Greene’s injury problems continued throughout 2013 and 2014, interrupting his training regime and preventing him from successfully defending his 2011 World crown in Moscow where he was eliminated in the semi-final. An attempt to retain his Commonwealth title also ended in the semi-finals, while running nearly two seconds outside his personal best. Greene resultantly withdrew himself from consideration for the 2014 European Athletics Championships, because of lack of form and a failure to make the agreed qualification time. In light of further injury issues, which resulted in him missing the 2016 Olympics in Brazil, in November 2016 Greene was stripped of his UK National Lottery funding by UK Athletics, and hence omitted from UKA’s world-class performance programme from 2017 onwards. Eight sendings off in the Football League in 1992 took the season’s total to 246, exceeding the previous record of 242 in 1982-3. The new edict on the ‘professional foul’ resulted in the increase in dismissals. The French diver Loïc Lefermedied on this day in 2007, he was the world free diving record holder until 2 October 2005, when he was surpassed by Herbert Nitsch. Loic was also a founder of AIDA in 1990 with Roland Specker and Claude Chapuis in Nice. In 2002 he set the world free diving record without any breathing apparatus at 162m. His first world record was 137m in 1999, on 30 October 2004; he extended this record to 171m in the no-limits free-diving category. He died during a private training session in Villefranche-sur-Mer when his equipment failed and he did not reach the surface in time. He was in training for a planned record attempt in July 2007. Julia Tsenova, award-winning Bulgarian composer, pianist and musical pedagogue, died on this day in 2010. She graduated in both Composition and Piano in the State Academy of Music in Sofia as a student of Prof. Pancho Vladigerov. Tsenova took part in the International Composers’ class in Sofia and Amsterdam, directed by Prof. Ton de Leeuw (1981, 1982). She attended many workshops in Europe. Her music was performed in different contemporary festivals, as well as at the International Composers’ Rostrum in Paris (1995). Since 1997 she was Professor of Piano and Dean at the Pop and Jazz Music Faculty in the State Academy of Music. She was a member of the Union of the Bulgarian Composers as well as of the International Society for Contemporary Music, and a President of the Bulgarian section. Her daughter Kristina Sandulova is also a concert pianist. Welsh athlete Frederick Charles Davies, better known as Tenby Davies, was born at South Parade in Tenby, Pembrokeshire in 1884. He went on to achieve recognition as one of the greatest runners Wales has yet produced and was regarded as one of the finest half-milers ever seen, winning the World 880yds championship at Pontypridd in 1909. Davies’ versatility as a world-class athlete is underlined by the fact that as well as excelling at the half-mile, he also won events throughout Britain at distances from 100yds up to a mile. 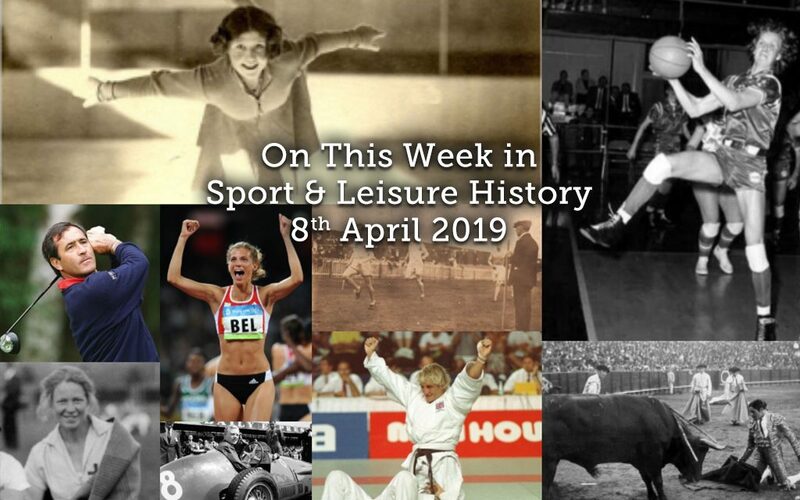 He was a regular competitor in the Welsh Powderhall 130yds handicap sprints, organised by the Pontypridd Athletic Club and held at Taff Vale Park in the town during the early part of the twentieth-century. But ‘Tenby’ is probably best remembered for taking on his great rival, Irishman Beauchamp R. Day of Blackpool, at Pontypridd on Monday 23 August 1909 where he decisively beat him over the half-mile distance, clocking an impressive 1 min. 57.6 seconds in the process, which was one of the fastest times recorded in the World for that year. He died at his home in Cardiff in 1932 aged only 48. 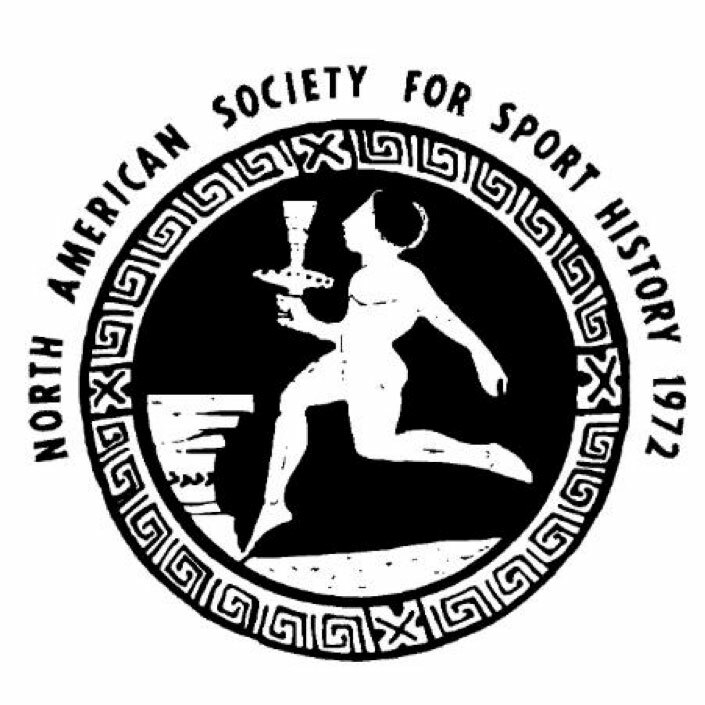 On this day in Athens in 1896, so it is widely reported, Stamasia Portrisi became the first woman to win a marathon. The newspaper “Messager d’Athenes”writing at the time that she was a peasant woman with pronounced features and a spare and wiry figure who had been running 24 miles in around 4½ hours during her practice runs. British papers were more ornamental with their reporting The Ipswich Journal editor writing that a modern Atalanta had come forward to enter the race, which he found not that surprising. Going on to say that instead of being impeded like the original Atalanta by golden balls she derives her sustenance from a natural golden ball, namely, the orange. Leeds became the first rugby league team to score 100 points when they beat Coventry 102-0 in 1913. Oliver Postgate was born today in 1925, he is best known as the creator and writer of some of Britain’s most popular children’s television programmes. Pingwings, Polges’ Wood, Noggin the Nog, Ivor the Engine, Clangers and Bagpuss, were all made by Smallfilms, the company he set up with Peter Firmin, and were shown on the BBC between the 1950s and the 1980s, and on ITV from 1959 to the present day. In a 1999 BBC poll Bagpuss was voted the most popular children’s television programme of all time. Today in 1930 Wilfred Rhodes ended his Test Cricket career at the age of 53 years and 165 days. In 1934, at Rugby in England, Sir Frank Whittle ground-tested the first jet engine designed to power an aircraft. Two European athletes who were both one-time world record holders in their respective events were born today in 1958. Klaus-Dieter Tafelmeier, German javelin thrower, who in 1986 threw 85.74m to record the first official world record for the new javelin type. This record lasted until May 1987 when Jan Železný threw 87.66m. Secondly, Ginka Zagorcheva-Boycheva, Bulgarian 100m hurdler most notable for winning at the 1987 World championships and held the world record for a year with a time of 12.25 sec, until it was beaten by Yordanka Donkova in August 1988. Zagorcheva is married to former Bulgarian high jumper Ivaylo Boychev; they have one daughter Ani born in 1981. Today in 1980 the US Olympic Committee endorsed a boycott of the Moscow Olympics, in juxtaposition, humanitarian and cancer research activist Terry Fox, on the very same day set off on his “Marathon of Hope” from St. John’s, Newfoundland. After having had one leg amputated, he embarked on his cross-Canada run to raise money and awareness for cancer research. Although the spread of his cancer eventually forced him to end his quest after 143 days and 5,373 kilometres (3,339 mi), and ultimately cost him his life, his efforts resulted in a lasting, worldwide legacy. The annual Terry Fox Run, first held in 1981, has grown to involve millions of participants in over 60 countries and is now the world’s largest one-day fundraiser for cancer research; over C$650 million has been raised in his name. and in 1992, Chad le Clos. South African Olympic, World and Commonwealth Games champion as well as the Commonwealth record holder in the 50 and 100m butterfly.He won gold in the 200m butterfly and silver in the 100m butterfly in the 2012 Olympics in London, as well as silver medals in the 200m freestyle and 100m butterfly in the 2016 Summer Olympics. He also won five medals at the 2010 Summer Youth Olympics in Singapore. Le Clos has won the Overall Swimming World Cup three times: 2011, 2013 and 2014. Cecilia Colledge, British figure skater died on this day in 2008 aged 87. She was the 1936 Olympic silver medalist, the 1937 World Champion, the 1937–1939 European Champion, and a six-time (1935–1939, 1946) British national champion. 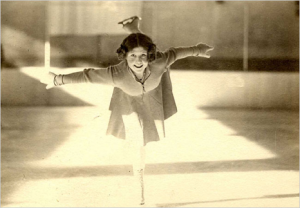 She began skating after watching the 1928 World Championships, which were held in London. Her mother, Margaret, had been invited by the mother of Maribel Vinson. At the event, Cecilia was inspired by the performances of Sonja Henie and Maribel Vinson, who won gold and silver respectively. During her career, Colledge was coached by Eva Keats and Jacques Gerschwiler. At eleven years and four months, she represented Great Britain at the 1932 Winter Olympics, where she became the youngest Olympic figure skater, finishing eighth. During World War II, there were no skating competitions. Colledge drove an ambulance in the Motor Transport Corps during the London Blitz. Following the war, she returned to competitive skating and won the British national title for the sixth and final time. After she turned professional, she won the 1947 and 1948 Open Professional Championship. She moved to the United States in 1951 and became a coach in Boston. She coached at the Skating Club of Boston between 1952 and 1977. 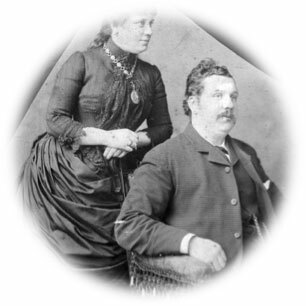 Among her students were Albertina Noyes, Paul McGrath, and Ron Ludington. She was inducted into the World Figure Skating Hall of Fame in 1980. At the 1936 European Championships, Colledge became the first female skater to land a two rotation jump in competition when she landed a double salchow. She is credited as being the inventor of the camel spin along with its catchfoot variation and the layback spin. Although not named after her, she was one of the first skaters who transitioned from a layback spin to a one hand Biellmann spin in her free programs. 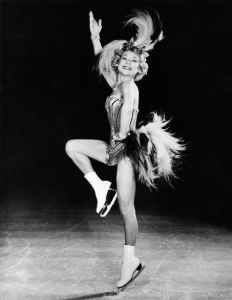 She also invented the one-foot axel jump, which is also known as the Colledge. Scottish footballer and manager John Cameron was born in 1872. He played as a forward for Queen’s Park, Everton and Scotland and was noted as an effective goal-maker and goal-scorer. In 1899 he became player-manager at Tottenham Hotspur and guided them to victory in the 1901 FA Cup. 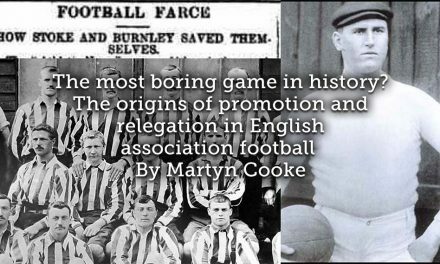 As a result, they became the only club outside the English Football League to win the competition. In 1898 he became the first secretary of the Association Footballers’ Union, which was the ill-fated fore-runner of the Professional Footballers’ Association. After Tottenham Hotspur, Cameron went to Germany to coach Dresdner SC. While there the First World War broke out and he was subsequently interned at Ruhleben, a civilian detention camp in the Spandau district of Berlin. The camp contained between 4,000 and 5,500 prisoners. Cameron was one of several former professional footballers at Ruhleben. Others included former England internationals, Fred Spiksley, Fred Pentland, Samuel Wolstenholme and Steve Bloomer, a German international Edwin Dutton and one of his former Tottenham players, John Brearley. Gradually a mini-society evolved and football became a popular activity. Cup and league competitions were organised and as many as 1,000 attended the bigger games. Cameron was prominent in organising and playing football within the camp and was secretary of the Ruhleben Football Association. During his time at the camp he was also a member of the Ruhleben Tennis Association. After the war he coached Ayr United for one season and then became a football journalist, author and publisher. He had previously worked as a columnist for various newspapers before the war. David Albritton, American athlete was born in 1913. He had a long career that spanned three decades and numerous titles and was one of the first high jumpers to use the straddle technique. Albritton had a number of similarities with all-time great Jesse Owens. Both were born in Alabama, Albritton in Danville and Owens in nearby Oakville; both attended East Technical High School in Cleveland, Ohio; both attended the Ohio State University and were coached by Larry Snyder; both were members of Alpha Phi Alpha fraternity; both competed in the 1936 Olympics. In 1936, Albritton and Cornelius Johnson both cleared 6-9 3⁄4(2.07 m) to set a world record at the Olympic Trials, becoming the first black athletes to hold the world record in the event. Albritton was second to Johnson at the 1936 Olympics, with a height of 6′ 6 3⁄4” (2.00 m). He claimed the silver medal in a jump-off after he and two other jumpers cleared the same height. Both Albritton and Johnson were snubbed by Hitler when they went to collect their medals. Albritton won or tied for seven National Amateur Athletic Union outdoor titles from 1936 to 1950. He was AAU outdoor champion in 1937, 1946, and 1947 and tied for three national collegiate titles, in 1938, 1945, and 1950. Albritton later became a high school teacher and coach. He served in the Ohio House of Representatives for six terms. In 1980, he was inducted into the USA Track and Field Hall of Fame. In 1936 Joe Payne set a then Football League record by scoring ten goals for Luton Town in a third division (south) match against Bristol Rovers. On this day in 1940 at Berkeley, American pole-vaulter Cornelious Warmerdam, became the first jumper to clear 15 feet (4.57m). However, that achievement was not ratified for a world record, and his later vault of 4.60 m on June 29, 1940 was the first ratified jump over 15 feet. During his career, Warmerdam vaulted 15 feet 43 times in competition, while no other vaulter cleared the mark a single time. Warmerdam surpassed the pole vault record seven times in a four-year span, and three of those marks were ratified as world records. His highest outdoor vault was 15′ 7-3/4″ (4.77 m), achieved at the Modesto Relays in 1942, a record which stood until 1957 when Bob Gutowski broke the mark using a metal pole. Warmerdam won the James E. Sullivan Award in 1942, but was never able to compete in the Olympics because the 1940 and 1944 games were cancelled due to World War II, and by 1948 he was coaching professionally and therefore ineligible. However he continued competing as an early practitioner of Masters athletics. He still is ranked in the world all-time top ten list in the M60 Decathlon. 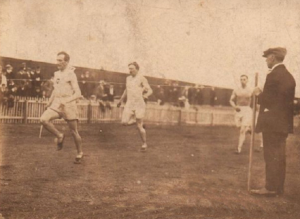 He beat the previous record of nine, scored by Tranmere’s ‘Bunny Bell’ less than four months earlier. Chess champion Gary Kasparov was born in 1963. He was only 22 years and 210 days when he beat defending champion, Anatoly Karpov, in 1985 to become the youngest world champion. Severiano Ballesteros became the youngest winner of the US Masters in 1980, at 23 years and 4 days. He won by four strokes from American Gibby Gilbert and Australian Jack Newton. Today in 1985 Katrin Dörre wins 1st female World Cup marathon in a time of 2:33.30. In 1986 the 50th edition of the US Masters was won by Jack Nicklaus, shooting a 279. At Jerez in 1986 Ayrton Senna, in a Lotus, beat Britain’s Nigel Mansell, in a Williams, to win the Spanish Grand Prix. The win, by a mere 14/1000th of a second, is one of the narrowest margins in F1 history. American basketball player Nera D. White died today in 2016 aged 80 from complications of pneumonia. She played in the AAU national tournaments for the Nashville Business College team while completing her education at George Peabody College for Teachers, which did not field a team. Later, she led the United States national women’s basketball team to their victory in the 1957 FIBA World Championship. 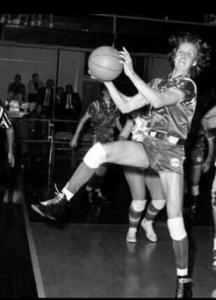 Throughout her career, she was awarded numerous accolades, including her induction to the Naismith Memorial Basketball Hall of Fame and the Women’s Basketball Hall of Fame. 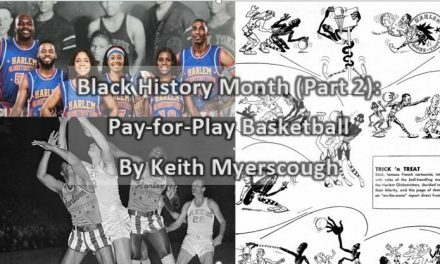 Playing at a time when there were no major professional women’s basketball leagues in the U.S., White distinguished herself, receiving many accolades as one of the greatest female players in history. 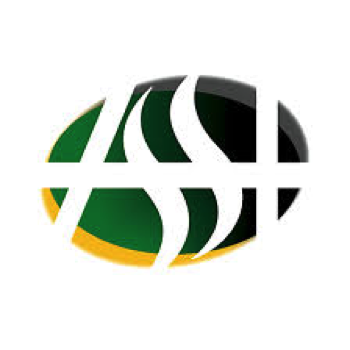 Talented in multiple sports, she also was distinguished as an All-World player by the Amateur Softball Association. Syd Gregory, also known as Edward Sydney Gregory, the New South Wales and Australian cricketer was born today in 1870. At the time of his retirement, he had played a world-record 58 Test matches during a career spanning 1890 to 1912. A right-handed batsman, he was also a renowned fielder, particularly at cover point. 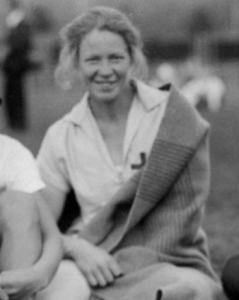 Ruth Svedberg, Swedish track and field athlete was born in 1903. She competed at the 1928 Olympics in the 100m, 4×100m relay and discus and won a bronze medal in the discus, failing to reach the finals in sprint events. Two years later she won bronze in the triathlon at the third Women’s World Games. 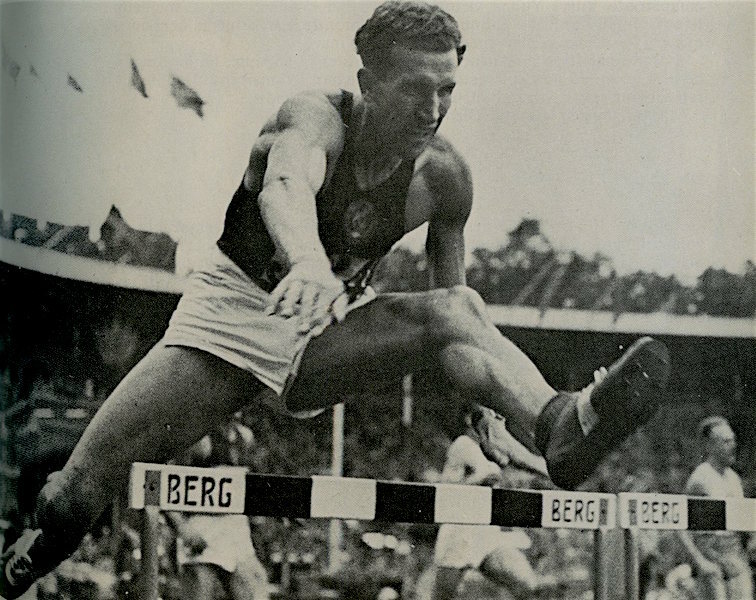 Svedberg held national records in the discus, shot put and triathlon and won the national championships in the long jump (1933), shot put (1933 and 1937), discus (1927, 1929–30, 1932–33 and 1949), javelin (1929, 1931 and 1933), triathlon (1929–31, 1933, 1937 and 1938), and in the 4×80m (1939–41) and 4×100m sprint relays (1943–45 and 1947). At her last national championships, aged 46, she won the discus with her best-ever throw of 38.98m. Three years earlier she set her personal best in the shot put while coming second at the national championships. Svedberg was a physiotherapist by profession. Paddy Hopkirk, former rally driver from Northern Ireland was born in 1933. He started his winning career in professional racing and rally driving in 1955. He finished third at the 1962 Monte Carlo Rally in a Sunbeam Rapier. Alongside Henry Liddon he won the 1964 Monte Carlo Rally in a Mini Cooper S, they are the most recent all-British crew to have won the event. Hopkirk also travelled to Australia during his career to drive for the BMC Works Team in the annual Bathurst 500 race for standard production cars at the Mount Panorama Circuit. He drove at Bathurst in a Morris Cooper S from 1965–1967, obtaining a best result of 6th outright and 3rd in class in the 1965 Armstrong 500 when paired with another great rally driver, Timo Mäkinen of Finland. In 1965, he won a Coupe d’Argent at the Alpine Rally. He won the 1965 and 1967 Circuit of Ireland Rally, the 1966 and 1967 Alpine Rally, and the 1967 Rally Acropolis. Hopkirk was elected as a life member of the British Racing Drivers’ Club in 1967, and is also president of the Historic Rally Car Register, and a patron of disability charity WheelPower. The most durable baseball player in the professional game, Pete Rose, was born in 1941. He played in a record 3562 major league games, for Cincinnati, Philadelphia and Montreal, between 1963 and 1986 and scored 2165 runs. In 1989, however, while manager of the Cincinnati Reds, he was banned for life for betting on the outcome of his team’s games. In the following year he was jailed for five months on a tax evasion charge. 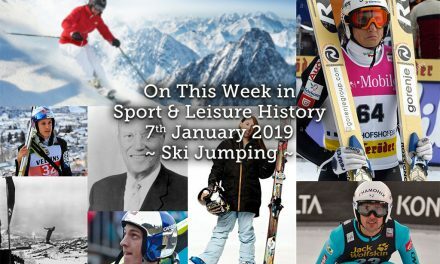 Britain’s best known and most successful male water skier, Mike Hazelwood, was born in 1958. He won a record seven British titles between 1974 and 1983. In 1977 he became the first British winner of the overall world title. He also took the jumping world crown in 1979 and 1981. In 1991, Tottenham Hotspur ended Arsenal’s dreams of an FA Cup and League double by beating them 3-1 in the FA Cup semi-final, the first to be played at Wembley Stadium. When they met at the same stage two years later, Wembley was again used as the venue. This time Arsenal won. The first women’s rugby World Cup final was played in Cardiff in 1991.
while 5 years later in 1996, another Brit wins the tournament: Nick Faldo claimed the prize after carding a 276. English footballer Wilf Mannion died on this day in 2000 aged 81, he made over 350 senior appearances for Middlesbrough. He also played international football for England. With his blonde hair, he was nicknamed “The Golden Boy”. He was arguably Middlesbrough’s greatest ever player. He joined his local team Middlesbrough F.C. in 1936 and went on to make 341 Football League appearances in total for them, scoring on 99 occasions. He scored 110 goals in all competitions for Middlesbrough. Mannion fought in France and Italy during World War II. At the end of the 1947–48 season he wanted a transfer, but Middlesbrough refused. In protest he did not play for much of the following season but he eventually backed down and started playing once again. He was capped on 26 occasions by England between 1946 and 1951, with his final appearance on 3 October 1951. He was a member of the England squad for the 1950 FIFA World Cup. Along with Middlesbrough and England teammate George Hardwick, he was also part of the Great Britain football team that beat the Rest of Europe 6-1 in 1947. After initially retiring as a player in 1954, Mannion subsequently joined Hull City. However, the Football League suspended him for articles he had written, and he left to play non-league football with Poole Town. He also had an unsuccessful spell as manager of Cambridge United. He was eventually awarded a testimonial match by Middlesbrough in 1983, alongside former Boro and England colleague George Hardwick. After his passing, Middlesbrough FC erected a statue of him outside the Riverside Stadium. In 2004 it was announced he was being inducted into the English Football Hall of Fame at the National Football Museum. The 160th Grand National was won by Robbie Power aboard Silver Birch on this day in 2007.